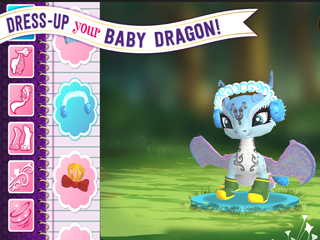 - Style your dragon with cute accessories, patterns, and magical auras! 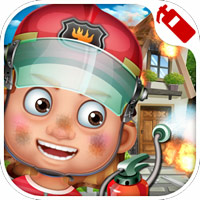 - Decorate your dragon's camp with fun animated decorations and furniture. - Baby dragons need lots of LOVE and attention. Feed and play with your baby dragon to keep her healthy and HAPPY. 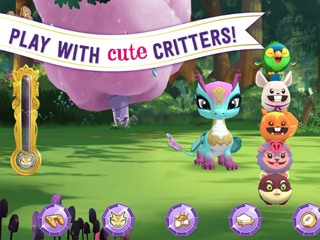 Don’t forget to play with their cute critter friends! - Teach your Baby Dragon how to fly during Flight Training and collect gems along the way, but be careful to avoid those wicked clouds! - Your dragon is truly magical, and it’s time to put her fire breathing skills to the test with Magic Training target practice. - Develop your dragon’s memory and match similar items through Memory Training. - Reach level 10 and go River Rafting with your Baby Dragon, don’t forget to collect those gems. 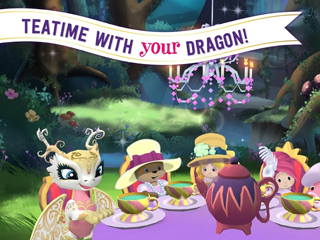 - Earn gems and orbs by playing with your dragon to purchase enchanting new outfits and accessories for your pet. - Dragons need to rest sometimes after an adventurous day; give her some time to nap and she’ll thank you for it. - Your dragon looks thirsty; let her sip some tea before going on your next big adventure. - Looks like your Baby Dragon wants to play fetch, throw the ball around with her. 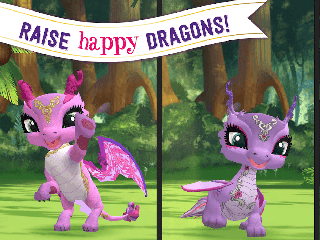 - Send your dragons on different adventures in the land of Ever After and earn rewards to help you level up faster! - Fly by any time as many more adventures await!